Whatsapp has introduced a Snapchat and Instagram stories like feature called Whatsapp Status that allows users to share photos, videos, and GIFs that will disappear in a day. WhatsApp is currently the most popular instant messaging and media sharing app. Every day, over 50 billion messages are sent via this app including photos, videos, and GIFs. In the most recent update, Whatsapp has introduced a Snapchat and Instagram stories like feature called Whatsapp Status which allows users to share photos, videos, and GIFs that will disappear after 24 hours. These status updates will only be available to contacts that are already added on Whatsapp. Emojis, doodles, and text can also be added to the media and can be sent to contacts, specific groups or individuals. After testing features on the beta version, WhatsApp has enabled the Status tab on Android, iOS, and Windows Phone. The feature is end-to-end encrypted and will ensure user security. It’s noteworthy to mention that this feature comes at a point when the company has completed of 8 successful years. Facebook which owns WhatsApp and Instagram, had replicated many features of SnapChat in the past including the ‘Story’ feature on Instagram. Moreover, Facebook is also planning to introduce ‘Messenger days’ in its Messenger app. This status feature will enable users to stitch together photos and videos in order to illustrate the message more effectively which cannot be done with text alone. Facebook has been in close competition with SnapChat and is constantly worried about the possibility that SnapChat will lift up its users across all its services especially those who consider Facebook old fashioned. And this fear seems somewhat right with SnapChat having 158 million users daily. “Starting today, we are rolling out an update to status, which allows you to share photos and videos with your friends and contacts on WhatsApp in an easy and secure way … Just like eight years ago when we first started WhatsApp, this new and improved status feature will let you keep your friends who use WhatsApp easily updated in a fun and simple way. From all of us at WhatsApp, we hope you enjoy it!”. The other prominent recent update was when Whatsapp enabled end-to-end encryption which has received a lot of praises from the tech community. 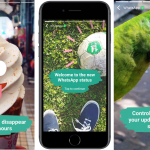 In another recent update, Whatsapp had announced it will enable Live Location feature.